Responses to the Future of Jobs Survey indicate that business leaders are aware of these looming challenges but have been slow to act decisively. Just over two thirds of our respondents believe that future workforce planning and change management features as a reasonably high or very high priority on the agenda of their company’s or organization’s senior leadership, ranging from just over half in the Basic and Infrastructure sector to four out of five respondents in Energy and Healthcare. Across all industries, about two thirds of our respondents also report intentions to invest in the reskilling of current employees as part of their change management and future workforce planning efforts, making it by far the highest-ranked such strategy overall (Figure 13). However, companies that report recognizing future workforce planning as a priority are nearly 50% more likely to plan to invest in reskilling than companies who do not (61% against 39% of respondents). Respondents’ expectations about future skills requirements also provide a relatively clear indication of where such retraining efforts might be concentrated in the most effective and efficient way. The Report categorizes work-relevant skills into abilities, basic skills and cross-functional skills (Figure 9), with particularly strong demand growth expected in certain cross-functional skills, cognitive abilities and basic skills such as active learning and ICT literacy. Applying a time lens to the potential for acquisition of these skills (what ManpowerGroup refers to as a teachable fit18), it seems clear that targeted training in cross-functional skills is within the remit of an individual company or even a group of companies coming together for synergy and greater efficiency. By contrast, cognitive abilities take much longer to develop and touch upon the need for high quality and inclusive secondary, primary and pre-school education. This is a field in which government policy will be required and companies can work with governments to clearly define the need and introduce new delivery models. Finally, basic skills are also traditionally acquired during formal education and before entering the workforce, but are relatively straightforward to acquire compared to cognitive abilities. This is a field in which companies have an opportunity to take a proactive approach to building their talent pipelines by working much more directly with education providers. In addition to such efforts by individual companies there are also opportunities for redeploying skills across industry boundaries from declining to growing parts of the labour market. For example, our respondents expect a decline in Sales and Related jobs and their accompanying skill sets in the Financial Services & Investors, Professional Services and Mobility industries, but a solid growth in demand for these skill sets in the Basic and Infrastructure, Information and Communication Technology and Media, Entertainment and Information industries. There may be opportunities for greater formalized inter-industry collaboration in facilitating the transfer of these skills and enabling the receiving industries to acquire experienced talent from industries that have declining demand for those same skills. Reskilling and retraining efforts may not yield the desired return if they are not cognizant of impending disruptive change and instead base their content primarily on today’s requirements or past successes. Many of our respondents are acutely aware of the limitations to their current planning for disruptive change and its implications for the talent landscape. Currently, only 53% of CHROs surveyed are reasonably or highly confident regarding the adequacy of their organization’s future workforce strategy to prepare for these shifts. The main perceived barriers to a more decisive approach include a lack of understanding of the disruptive changes ahead, resource constraints and short-term profitability pressures and lack of alignment between workforce strategies and firms’ innovation strategies (Figure 12). However, there are some significant differences between industries in this regard. The Information and Communication Technology sector reports a comparatively good understanding of drivers of change and instead sees resource constraints as its main barrier whereas the Media, Entertainment and Information industry—perhaps the sector that has seen the largest scale of disruption of its traditional business model to date—reports a very good understanding of the nature of disruptive changes ahead and is instead mainly concerned about short-term shareholder pressures (Table 9). Furthermore, we find that CHROs’ confidence in the adequacy of their company’s or organization’s workforce strategy is strongly correlated with the perceived priority given to these issues by top management and with perceived alignment between workforce strategy and innovation strategy. Conversely, CHROs who do not see these two measures in place are more than 50% more likely not to express confidence in their firm’s strategy. 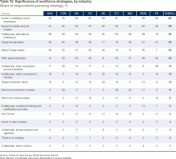 In order to meet the talent and skills challenges brought about by expected business model disruptions, companies envisage pursuing a range of innovative workforce strategies; providing employees with wider exposure to roles across the firm, stepping up efforts to target the female talent pool and collaborating with the education sector more closely than in the past are some of the more popular measures (Figure 13). 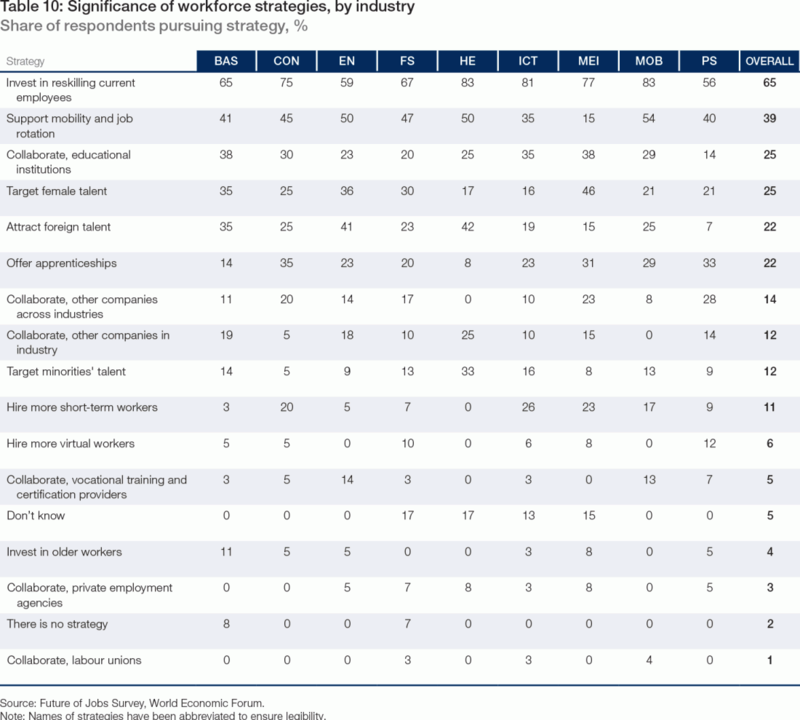 Across all industries, plans to invest in reskilling current employees feature prominently among reported future workforce strategies. However, the prevalence of insufficient understanding of disruptive changes as well as resource constraints as main barriers to managing change perhaps helps to explain the current mismatch between the magnitude of the upcoming changes and the relatively timid actions being taken by companies to address these challenges so far. For example, a number of promising approaches appear underutilized across almost all industries. Despite widespread proclamations in support of workplace gender parity, only one in four companies envisages actively targeting female talent, ranging from 46% in the Media, Entertainment and Information sector to only 16% in Information and Communication Technology. There also seems to be varying openness to collaboration, whether within or across industries, with the latter seemingly much more acceptable. Furthermore, a focus on making better use of the accumulated experience of older employees and building an ageless workforce barely register among proposed workforce strategies. In fact, these findings are in striking contrast with the envisaged measures of respondents who report both that they are confident in the adequacy of their future workforce strategy and that these issues are perceived as a priority for their top management. This group is more than twice as likely to be targeting female talent and minority talent and over 50% more likely to be supporting employees’ mobility and job rotation within the firm. They are significantly less likely to plan to hire more short-term workers or to use expatriate talent, in line with their equally much higher probability to invest in internal talent and reskilling, as already noted above. There is a need in several of these areas for bolder leadership and strategic action within companies and within and across industries, including partnerships with public institutions and the education sector. While the implications of accelerating disruptive change to business models are far-reaching—even daunting— for employment and skills, rapid adjustment to the new reality and the opportunities it offers is possible, provided there is concerted effort by all stakeholders. For government, it will entail innovating within education and labour-related policymaking, requiring a skills evolution of its own. For the education and training sector, it will mean vast new business opportunities as it provides new services to individuals, entrepreneurs, large corporations and the public sector. 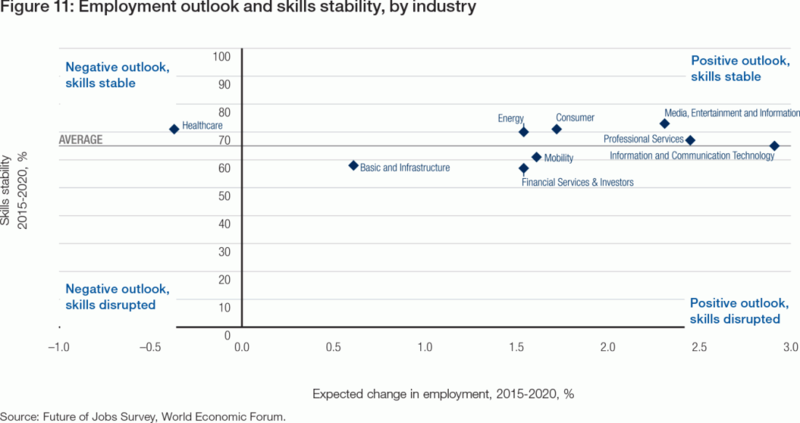 The sector may become a noteworthy new source of employment itself. For businesses to capitalize on new opportunities, they will need to put talent development and future workforce strategy front and centre to their growth. Firms can no longer be passive consumers of ready-made human capital. They require a new mindset to meet their talent needs and to optimize social outcomes. This entails several major changes in how business views and manages talent, both immediately and in the longer term. In particular, there are four areas with short term implications and three that are critical for long term resilience. Reinventing the HR Function: As business leaders begin to consider proactive adaptation to a new talent landscape, they need to manage skills disruption as an urgent concern. They must understand that talent is no longer a long-term issue that can be solved with tried and tested approaches that were successful in the past or by instantly replacing existing workers. Instead, as the rate of skills change accelerates across both old and new roles in all industries, proactive and innovative skill-building and talent management is an urgent issue. What this requires is an HR function that is rapidly becoming more strategic and has a seat at the table—one that employs new kinds of analytical tools to spot talent trends and skills gaps, and provides insights that can help organizations align their business, innovation and talent management strategies to maximize available opportunities to capitalize on transformational trends. Making Use of Data Analytics: Businesses will need to build a new approach to workforce planning and talent management, where better forecasting data and planning metrics will need to be central. Earlier mapping of emerging job categories, anticipated redundancies and changing skills requirements in response to the changing environment will allow businesses to form effective talent repurposing strategies within their company, their own industry and across industries. HR has the opportunity to add significant strategic value in predicting the skills that will be needed, and plan for changes in demand and supply. To support such efforts, the Forum’s Future of Jobs project provides in-depth analysis on industries, countries, occupations and skills. Talent diversity—no more excuses: As study after study demonstrates the business benefits of workforce diversity and companies expect finding talent for many key specialist roles to become much more difficult by 2020, it is time for a fundamental change in how talent diversity issues—whether in the realm of gender, age, ethnicity or sexual orientation—are perceived and well-known barriers tackled. In this area, too, technology and data analytics may become a useful tool for advancing workforce parity, whether by facilitating objective assessment, understanding typical careers paths and cliffs, identifying unconscious biases in job ads and recruitment processes or even by using wearable technologies to understand workplace behaviours and encourage systemic change. Leveraging flexible working arrangements and online talent platforms: As physical and organizational boundaries are becoming increasingly blurred, organizations are going to have to become significantly more agile in the way they think about managing people’s work and about the workforce as a whole. Work is what people do and not where they do it. Businesses will increasingly connect and collaborate remotely with freelancers and independent professionals through digital talent platforms. Modern forms of association such as digital freelancers’ unions and updated labour market regulations will increasingly begin to emerge to complement these new organizational models. For policymakers, an important set of regulations concerns the portability of safeguards and benefits between jobs and the equivalent treatment in law of different forms of labour and employment types. Rethinking education systems: By one popular estimate 65% of children entering primary schools today will ultimately work in new job types and functions that currently don’t yet exist. Technological trends such as the Fourth Industrial Revolution will create many new cross-functional roles for which employees will need both technical and social and analytical skills. Most existing education systems at all levels provide highly siloed training and continue a number of 20th century practices that are hindering progress on today’s talent and labour market issues. Two such legacy issues burdening formal education systems worldwide are the dichotomy between Humanities and Sciences and applied and pure training, on the one hand, and the prestige premium attached to tertiary-certified forms of education—rather than the actual content of learning—on the other hand. Put bluntly, there is simply no good reason to indefinitely maintain either of these in today’s world. Businesses should work closely with governments, education providers and others to imagine what a true 21st century curriculum might look like. Incentivizing lifelong learning: The dwindling future population share of today’s youth cohort in many ageing economies implies that simply reforming current education systems to better equip today’s students to meet future skills requirements—as worthwhile and daunting as that task is—is not going to be enough to remain competitive. Ageing countries won’t just need lifelong learning—they will need wholesale reskilling of existing workforces throughout their lifecycle. Governments and businesses have many opportunities to collaborate more to ensure that individuals have the time, motivation and means to seek retraining opportunities. For example, Denmark allocates funding for two weeks’ certified skills training per year for adults, and the strong emphasis the country places on in-work training helps explain its very high degree of employment mobility, with 70% of workers considering mid-career transitions a ‘good thing’, compared to 30% or less in most other European countries.20 At the company-level, technology can be continuously leveraged to upskill and re-skill employees. As an integral part of its practical and action-oriented application, the World Economic Forum’s Global Challenge Initiative on Employment, Skills and Human Capital is deploying a number of regionally focused collaboration projects, reflecting on how emerging economies may tackle the challenge of closing skills gaps and providing job opportunities to their fast-growing young population. By tailoring and applying insights and recommendations developed at the global level, these projects support efforts to improve the state of employment, skills and human capital in local and regional contexts. Furthermore, they serve as an invaluable source of bottom-up evidence and learnings that can be elevated and shared to foster cross-regional learnings and global adaptation. Currently, the Forum is focusing on three such projects: the New Vision for Arab Employment, described in more detail below, the Africa Skills Initiative and the India Skills Initiative. The New Vision for Arab Employment serves as a platform for driving action and partnerships through nationally and regionally focused projects that promote collaboration and partnership between local and multinational businesses as well as governments and the education and training sector. Working in close collaboration with key business, public sector and civil society leaders, the initiative rallies key regional actors through calls-to-action and pilots best practices to effect change. It also aims at identifying key cross-cutting areas of intervention that will help address employment, skills and human capital gaps for the 21st century. Talent is one of the most critical factors for an economy’s innovative capacity and growth prospects. With more than half of its population under 25 years of age and the world’s highest youth unemployment rate, the Middle East and North Africa (MENA) region faces critical challenges. Concurrently, business leaders report difficulties in filling roles. In particular, persistently high youth unemployment rates in the Gulf Cooperation Council countries demonstrate that addressing youth unemployment effectively requires more than budgetary capacity and economic growth. Launched in 2013, the aim of the first phase of the initiative was to better understand how to turn this youthful populace into a youth dividend and implement best practices of interventions to inverse the critical trend of youth unemployment. For example, the Forum’s Human Capital Index showed that despite significant investment in education by many countries, the region is not equipping youth with skills for the 21st century. Out of the 124 economies covered by the Index in 2015, only two from the region—the United Arab Emirates (54) and Qatar (56)—made it into the upper half of the rankings. Kuwait (93) and Saudi Arabia (85), whose GDP per capita is at least fivefold higher, performed at a comparable level to Morocco (95) and Egypt (84), respectively, highlighting that economic performance alone is an inadequate measure of countries’ abilities to successfully leverage their human capital endowment. In addition, it was found that the region runs the risk of worsening unemployment and talent shortages if skills gaps are exacerbated due to technological changes that further disrupt business models and labour markets. In addition to a set of founding pledges that impacted nearly 50,000 youth, the initiative has engaged others to join forces in order to reach—or surpass—the goal of 100,000. The pledge model also serves as a platform for continued learning and collaboration between businesses seeking to address the region’s talent value chain and as a hub for exchange with governments, civil society organizations and experts. Recognizing that current company-specific efforts must be supplemented with systemic change, the leaders of the Forum’s Regional Business Council and others are engaging in a new phase of the initiative, which will directly build on the insights provided by the Future of Jobs Insight Report. It is expected that the Future of Jobs work will force a more precise dialogue to strengthen the existing framework of collaboration for business leaders and provide new data and analysis for better-informed decision-making in the future with a view to enhancing talent pipelines and increasing competitiveness in the region. In particular, leaders in the region are keen to understand what skills should constitute the core of education in the future and what reforms the private sector, particularly within key industries, can initiate in a dialogue with the public and education sectors to leapfrog towards a more resilient and efficient learning and skills value chain. Furthermore, as disruptive change is expected to spread across the globe, what will be the impact in the region and how will the actors in the region prepare for this evolution? New industries and business models will emerge, new talent will be required and so this future-oriented body of work will be a critical tool to broaden the space for solutions to allow both existing and new industry sectors to thrive and support the region’s overall development. 18 See: ManpowerGroup, Teachable Fit: A New Approach to Easing the Talent Mismatch, 2010, http://www.manpowergroup.com/sustainability/teachable-fit-inside.html. 19 See: World Economic Forum and the Global Agenda Council on Employment, Matching Skills and Labour Market Needs: Building Social Partnerships for Better Skills and Better Jobs, 2014. 20 See: Gvaramadze, 2010, and Voss, 2009. 21 See: World Economic Forum, Disrupting Unemployment: Business-led Solutions for Action, 2015.